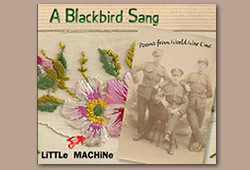 A Blackbird Sang is an album of our settings of 6 poems with a WW1 connection. The CD comes with a 12 page booklet containing the text of the poems, biographical information on the poets and our thoughts on why we chose the poems. 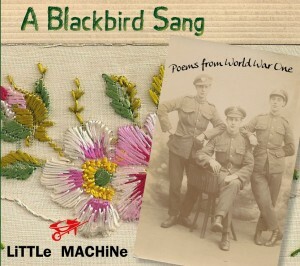 A Black bird sang costs £7.99 (plus P&P) from our online shop. WB Yeats – ‘An Irish Airman Foresees His Death’. Posted in News and tagged a e housman, adlestrop, charlotte mew, doomed youth, dug-out, edward thomas, i saw a man, irish airman, may 1915, sassoon, shaw-stewart, wilfred owen, ww1 poems, ww1 poets, yeats by Walter Wray.